Suzhou embroidery, Su embroidery for short, is a traditional art which has a high requirement on hand skills. A piece of good Suzhou Embroidery is a perfect combination of embroidery techniques and art. Normally we can judge a Suzhou embroidery work from the following criteria. 1. To judge the artistic value of the picture. In the present market, most of the silk embroideries are reproduced from photographs or oil paintings. But there are some masterpiece silk embroideries made by some master embroidery artists who did both the drawing and embroidering themselves. I. Size of silk threads. Su embroidery is made silk threads on silk fabric stitch by stitch. The size of silk threads used in one silk embroidery decides the quality of its quality to a large extent. Generally speaking, a higher quality silk embroidery is often hand embroidered with thinner silk threads than a lower quality one. To make the embroidery work as fine as possible, the embroidery artists do not use full silk threads but split silk threads to make the embroidery work. In many Top Quality silk embroideries we make, the silk threads used are only 1/16 to 1/32 of one full silk thread. 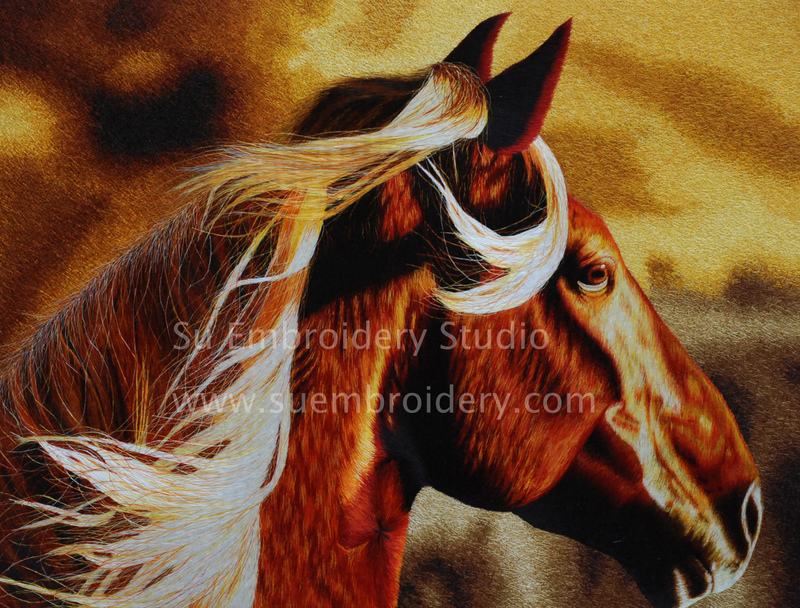 By using thinner silk threads, the embroidery artists can make the embroidery work as detailed as possible. It's a bit like to use a very small brushes to paint a painting with many minute details. If the brushes are too large, it's impossible to display all the details by painting and some details will inevitably be lost. The same to silk embroidery, if the silk threads are not thin enough, the embroidery work won't look as vivid as the original picture. III. Length of stitches. In some poorly made silk embroideries, the stitches are very long. It's very clear for two silk embroideries of the same design and same size, the one made with long stitches will be made in a shorter time. Long stitches save the embroidery artist's time but affect the whole quality of the embroidery work. The long stitches are not strong enough. After some time, the stitches will get loose and some silk threads may come out. A high quality silk embroidery is often made with very short stitches. The embroidery work is very strong, dense and smooth. A high quality silk embroidery won't get loose even after some time of being rolled up during shipping. III. Density of the embroidery work. 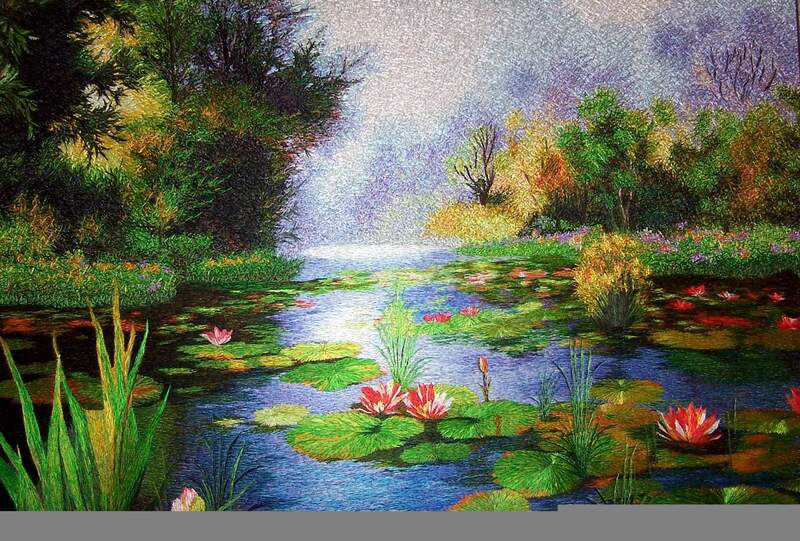 A high quality embroidery painting is made with several layers of embroidery work. The base layer is often made with fat silk threads. The upper layers are made with thinner silk threads. The top layer made with the thinnest silk threads. By doing the embroidery in this way, embroidery artist can make the embroidery work as detailed as possible and more colors of silk threads can be mixed. IV. Colors of silk threads. A low quality silk embroidery uses silk threads of less than 10 colors while a high quality silk embroidery uses silk threads of more than 100 colors. The result is very clear. 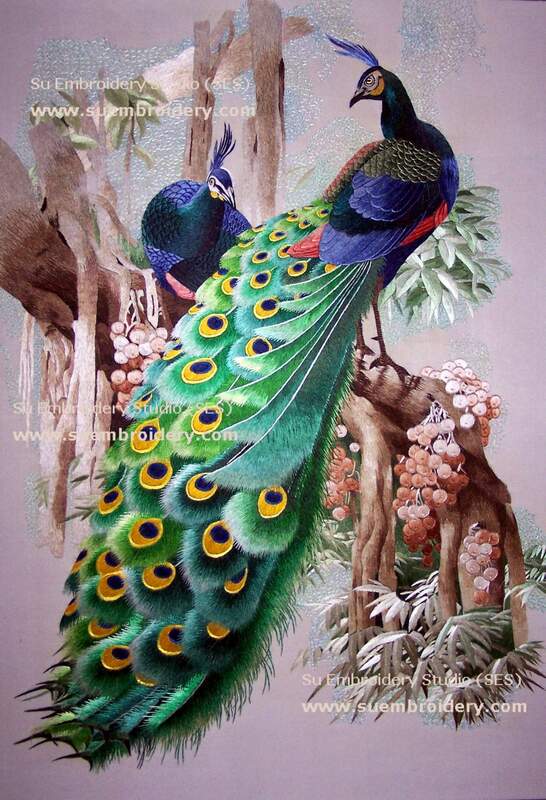 The high quality embroidery picture looks vivid and more realistic while the low quality silk embroidery looks dull. To make the color of the embroidery work looks natural, embroidery artists often use many similar colors in one small part of the embroidery work. Sometimes one red color of the embroidery work has dozens of different red colors mixed, from light to dark. The color differences are so tiny that most people are not able tell their exact differences. But the embroidery artists know how to use them well. By mixing the similar colors, the final colors of the embroider work transit smoothly. The embroidery picture looks more like a photograph. V. The most important, it's hand embroidered, not machine embroidered. On how to tell the machine made embroideries, please refer to the article 'Differences Between Hand Embroidery and Machine Embroidery'. Below are some photos of embroideries of the same design but at two quality levels, Fine Quality and Top Quality. Please enlarge the photos and compare the embroideries carefully. You will have a better understanding about the above explanation. If you have a silk embroidery that you are unsure of its quality, please feel free to email us some photos of it to get a free embroidery quality appraisal.